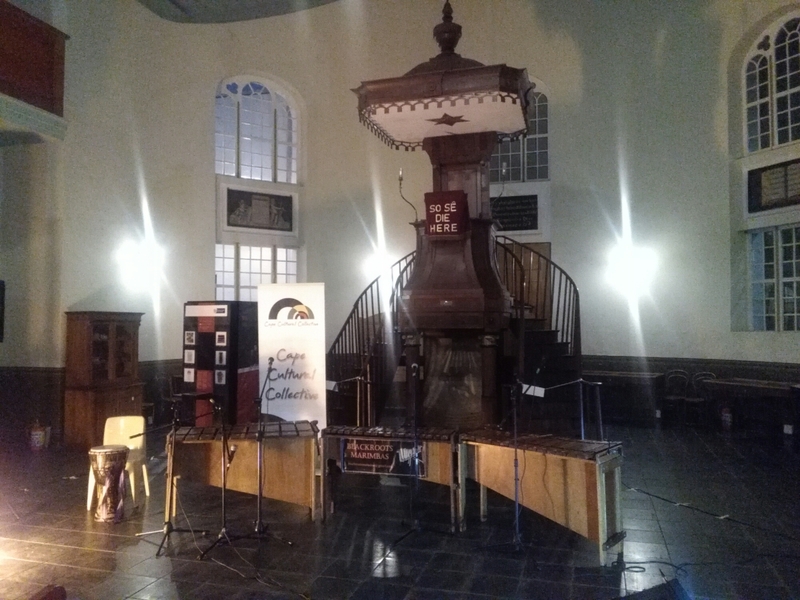 Once again the stage was set for a night filled with music, drama, poetry and dance. The Cape Cultural Collective presented their monthly programme this time focusing on gender under the theme WOMEN ARISE – #Phakamani Bafazi. The line up included a diverse array of talented women, young and not so young….but by their energy these women were definitely young at heart. 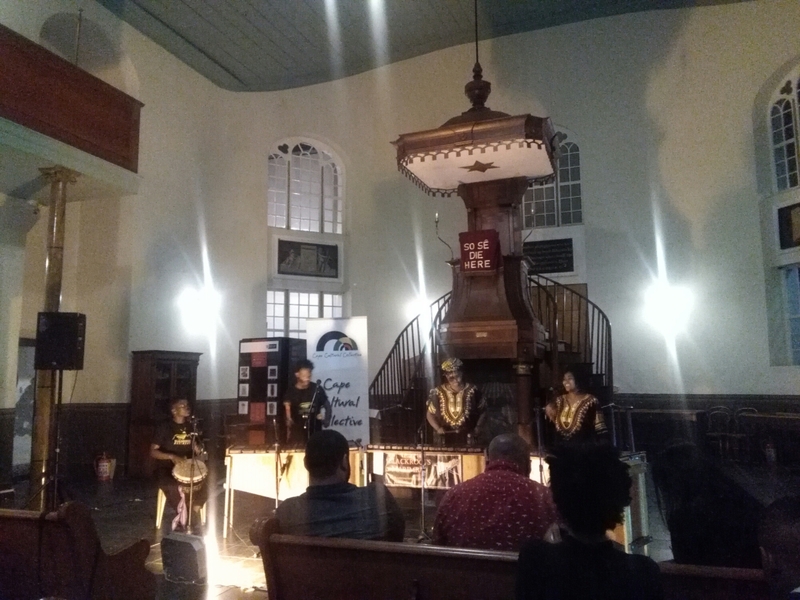 The Blackroots Marimbas kicked off the evening with a vibrant performance incorporating a saxaphone solo, not sure if that was planned but it was awesome, the sound of the Marimba is really something to different and will definitely get any crowd jiving. 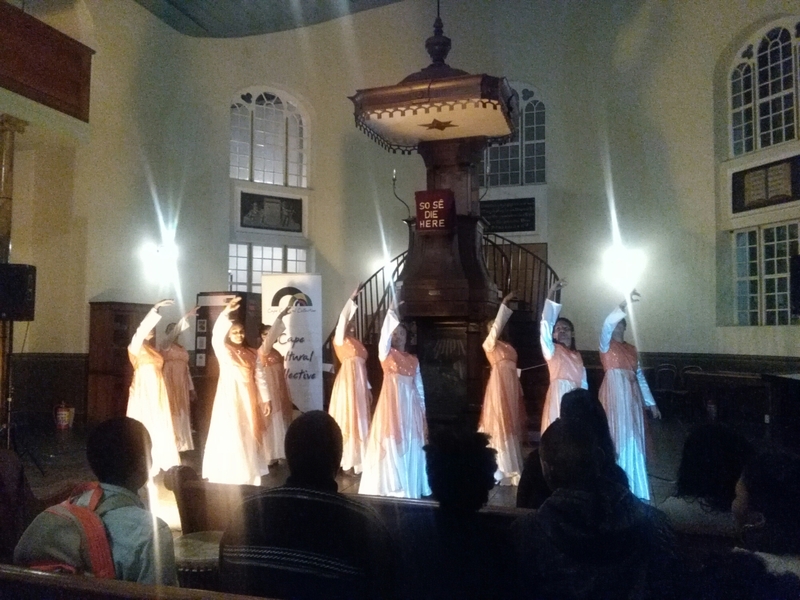 The Hosanna Dance Group inspired women to never give up and keep the faith through their spiritual dance act and tambourine dance, the routine was a sight to behold and highly entertaining. From young ladies we skipped a few generations ahead to the Golden Years Senior Club these ladies lit up the stage with their rendition of Siyahamba deserving their moment to shine – Welldone. Natasha C Tafari aka Sabannac brought a different element to the night as she Turned it Up with rhythm and poetry flowing through hip-hop beats – mo fire mo fire my sister. 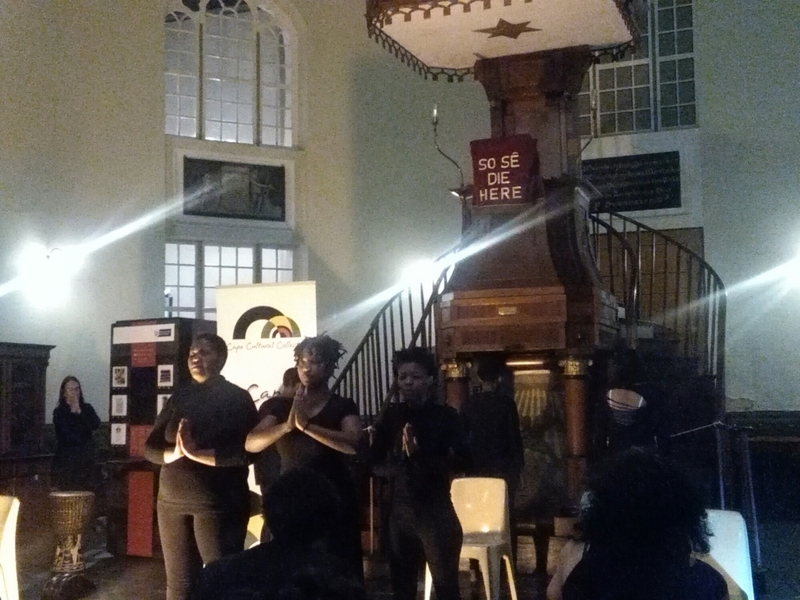 One of the stand out performances of the night was an extract of the play #WhatsLeftOut from black women students of the University of the Western Cape – I was really shocked and intrigued by the powerful message they portrayed, it was something unexpected but clear and precise in the words – Still I Breath, You are Enough – Love Yourself. 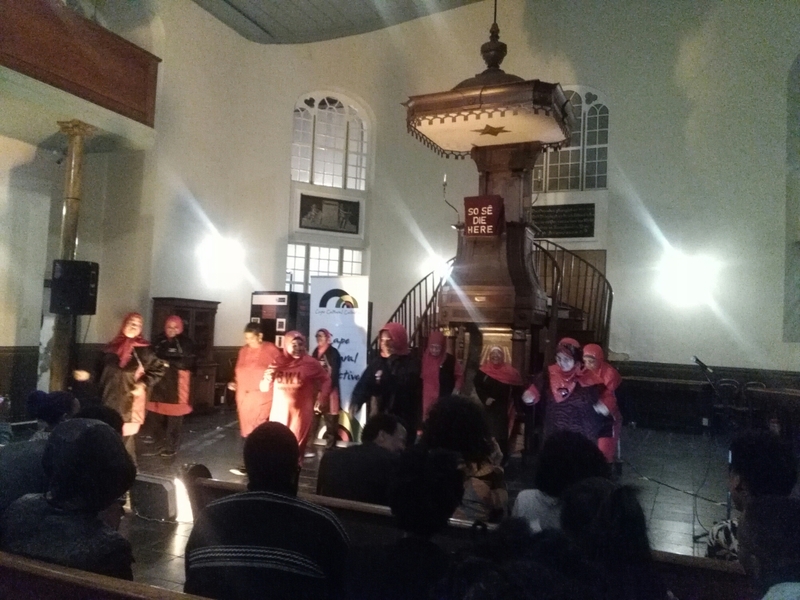 After the break we had the Bonteheuwel Walking Ladies who after tonight changed their name to dancing ladies, jislaaik maar die anties kan dans. Hulle het vir ons jong mense gewys hoe om ons lyf ‘n leka tyd te gee, keirie of tenot as jy wil dans dan moet jy dans. 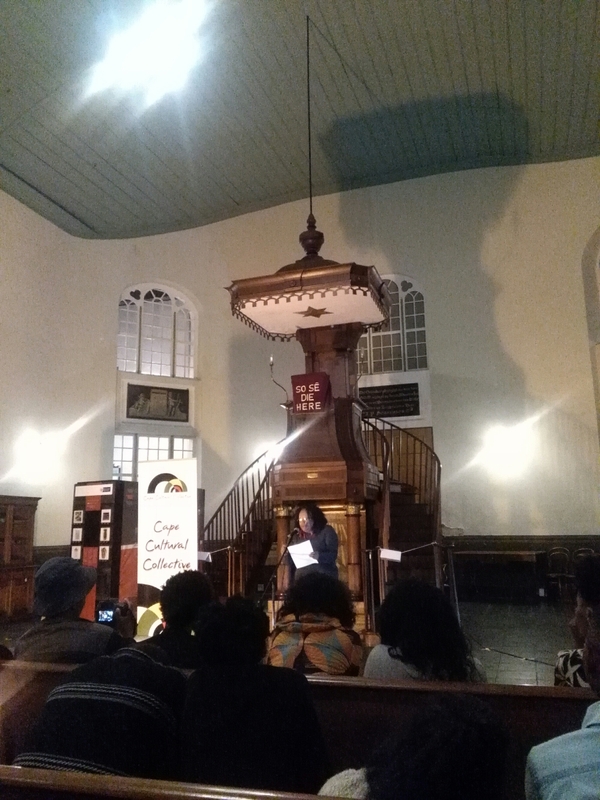 Koleka Putuma stired up emotions as she gave us the truth through her poetry she gave new meaning to the phrase Truth Hurts, but sometimes you need to hear these truths to break free and be inspired to change. Janine aka Blaq Pearl soothed the audience with some jazz vocals her voice is amazing that I just had to purchase her CD, ya ek support my mense vannie Afrikaaps aweh. When Dian Ferrus walked on stage and recited her poems you felt the silence and concentration in the audience, the way she delivers her work you feel that she is someone who deserves the respect bestowed upon her a true legend of the industry and an inspiration to many. Lastly we had the loud and proud Maya Spector end off a fantastic evening with song and dance, she has an amazing stage presence and her energy is contagious. A full line up of powerful, inspiring talented women who definitely rose to the occasion – they entertained us as best they could and I thank them and the organisers for their time and effort. For more information on The Cape Cultural Collective follow them on Facebook or email capeculturalcollective@gmail.com. This entry was posted in Uncategorized on August 26, 2016 by shaunjengel. 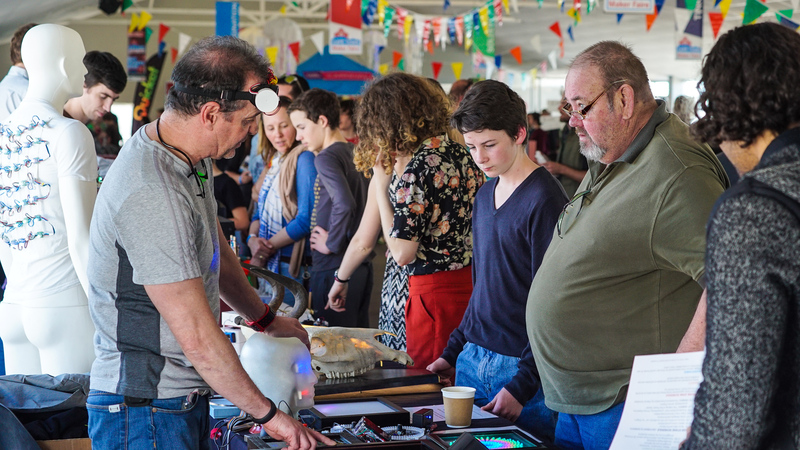 After a successful inaugural edition in 2015, the Cape Town Mini Maker Faire is back with an even bigger and better event this year. 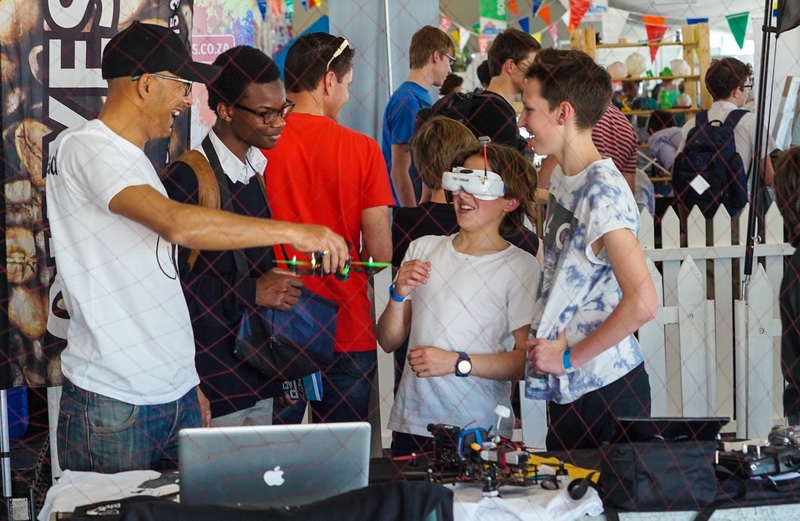 Placing a spotlight on DIY and technology, this year’s Mini Maker Faire will bring techies, tinkerers, hackers, hobbyists, crafters, artists, tech gurus, authors and inventors together to engage with the public and exchange ideas at the Cape Town Science Centre in Observatory from 26 to 28 August 2016. 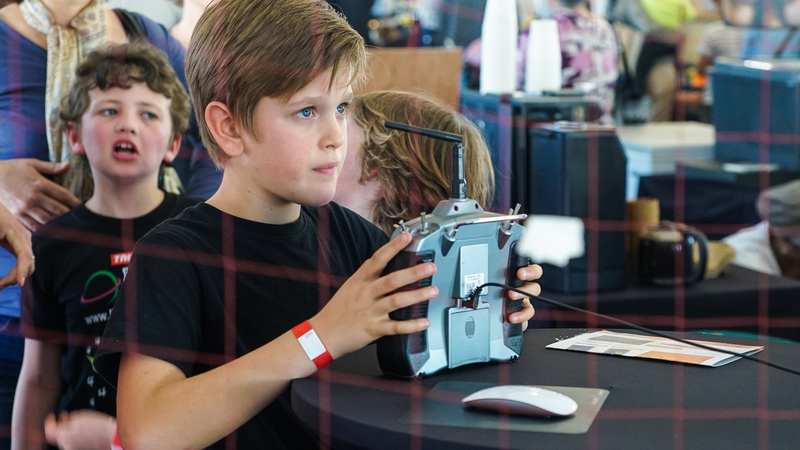 Described as the “Greatest Show (and Tell) on Earth”, the Mini Maker Faire is a space where people with a passion for learning, collaboration and creativity can connect. 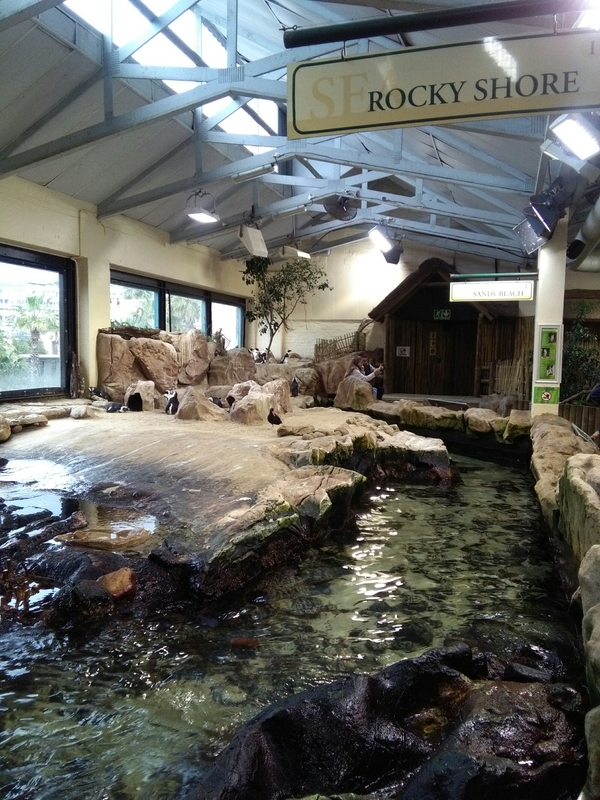 Part science fair, part trade fair, and part something entirely new, the event offers a great day out for people of all ages to interact with amazing creations and experience the exciting world of the Makers. 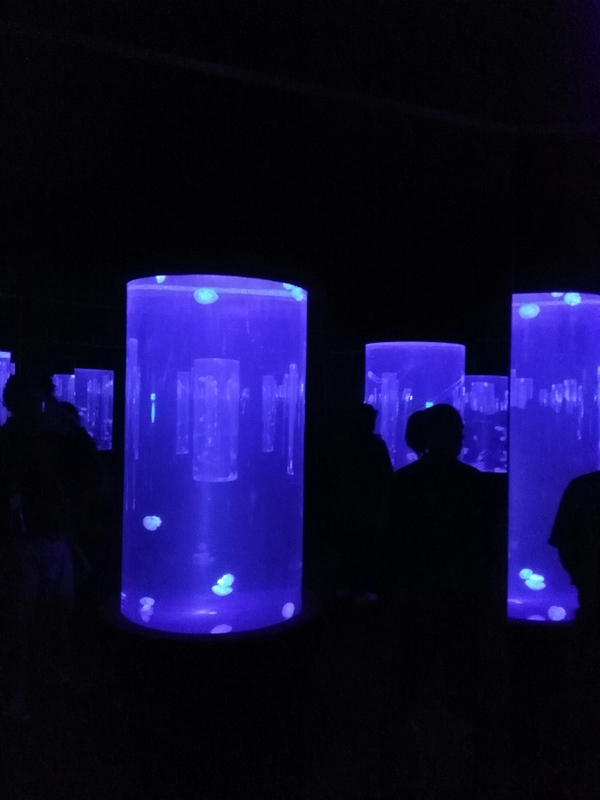 “Makers across the world are shaking up the way that we think and interact with our environment. They’re coming up with innovative solutions to help solve social problems, as well as some really fun and creative projects – and that’s why we are returning for another year of the Cape Town Mini Maker Faire,” says Alayne Reesberg, Programme Director and Producer of Cape Town Mini Maker Faire, and former CEO of World Design Capital Cape Town 2014. The global Maker Movement has its roots in engineering, industrial design, manufacturing and education. It’s DIY on a whole new level, fusing technology and creative ideas with traditional craftsmanship to create and market products, and influence a new wave of manufacturing innovation. The movement empowers people to create, imagine and solve problems differently, calling for collaboration and peer-to-peer idea sharing or a “do it with others” (DIWO) approach. More than 60 exciting local Makers will be on show, as well as installations by the Faire’s knowledge partners: PriceWaterhouseCoopers Western Cape, Stellenbosch University’s Launch Lab, the Cape Innovation and Technology Institute and the University of the Western Cape. Exhibits will range from home-grown drones to robotics and Arduino projects, space projects and kit makers to 3D printers, rockets and RC toys, radios to gaming and electric vehicles, as well as a host of handmade craft and fashion projects and some exciting installations of “art cars” straight from the Afrika Burn festival. In addition, an enclosed drone zone will let visitors test their flying skills, while the PPC Imaginarium, South Africa’s most supportive art and design competition for emerging creatives, will showcase industrial design, fashion, film, jewellery and sculpture all made from concrete. PPC Imaginarium will also host an interactive workshop, together with Cemcrete, where members of the public can learn how to make their own objects from quick-drying cement. 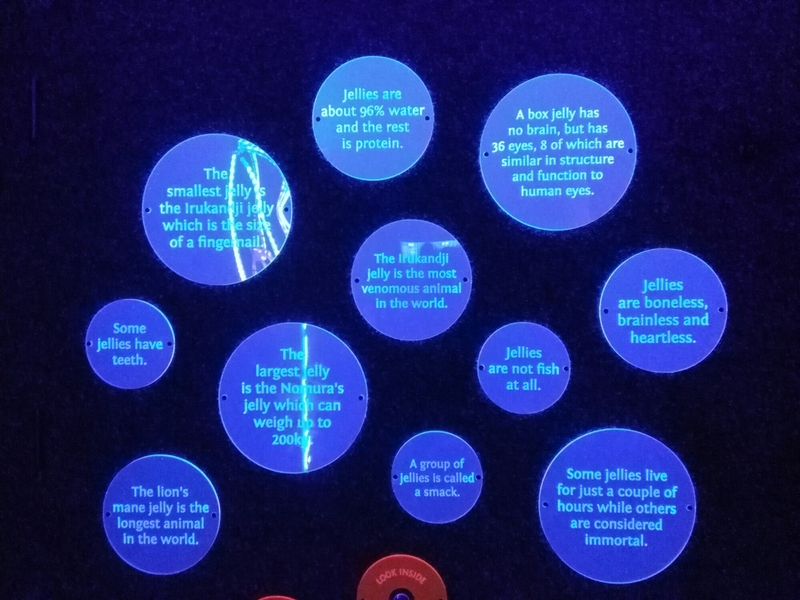 A popular attraction with both kids and their “kidults” at the 2015 Mini Maker Faire was the participative Maker Station, run by Felix Holm and his team at the Cape Town Maker Station based in Woodstock. Designed especially with children in mind, this feature returns again this year with another mountain of defunct appliances that can be upcycled into innovative creations. 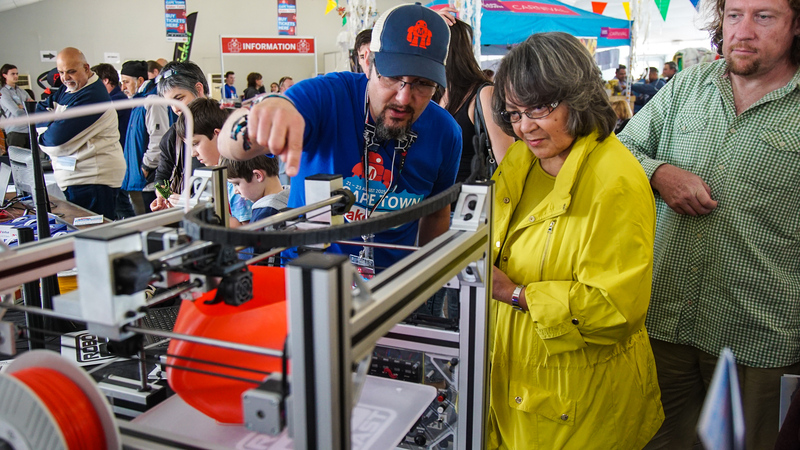 The second annual Cape Town Mini Maker Faire is sponsored by the City of Cape Town, PPC, the Western Cape Department of Agriculture and Peninsula Beverage Company. The event will take place between 26 to 28 August 2016 at the Cape Town Science Centre, 370B Main Road, Observatory, Cape Town, one of the support partners of the event. Tickets can be purchased via quicket.co.za. 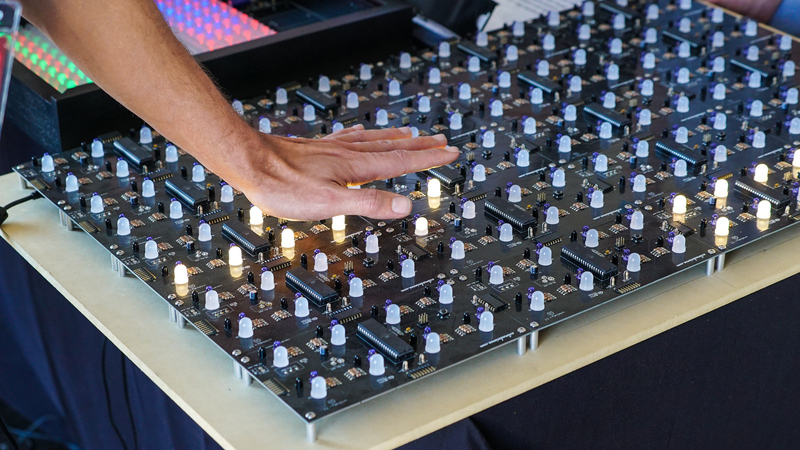 For more information, visit http://capetown.makerfaire.com/ or follow the event on Twitter (@makerfaireCT), Instagram (@ctminimakerfaire) or Facebook.com/CTMiniMakerFaire. 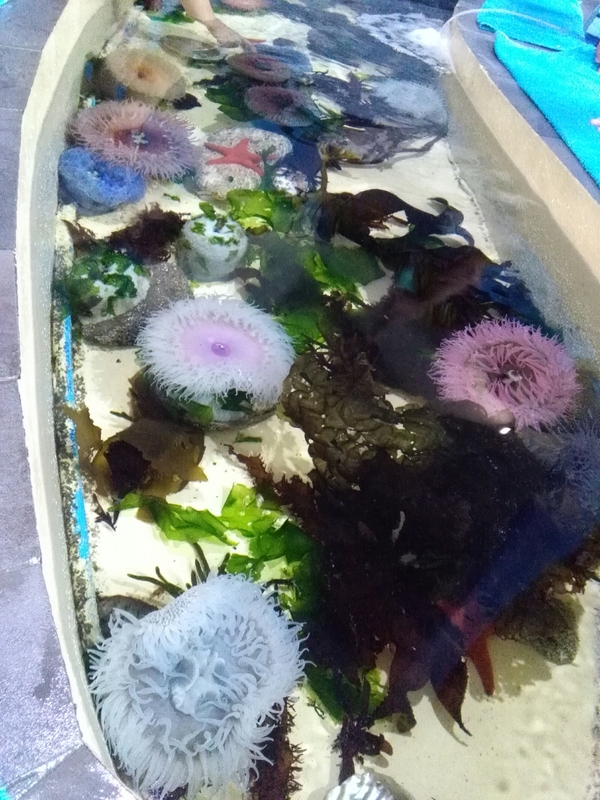 Venue: Cape Town Science Centre, 370B Main Road, Observatory, Cape Town, 7925. Parking: An extra 200 parking bays have been made available for the weekend at the Groote Schuur complex. This entry was posted in Uncategorized on August 24, 2016 by shaunjengel. 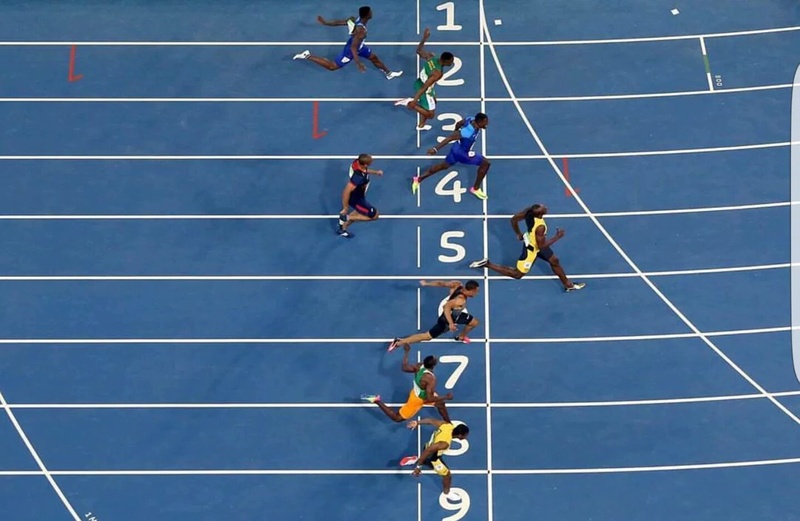 South Africa went ballistic this morning when our Monday turned GOLD at the RIO 2016 Olympics……even Usain Bolt couldn’t believe his eyes when Wayde van Niekerk obliterated Michael Johnson’s record to become the fastest man in the WORLD around the 400m track. 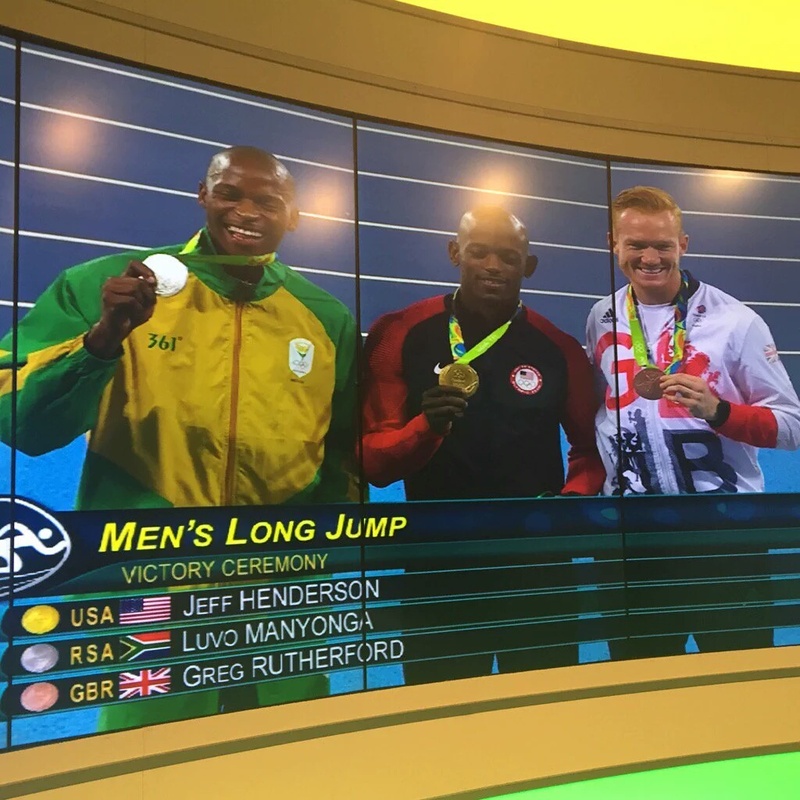 Every athlete has a story and it is these stories that inspire us and encourage us, like Luvo Manyonga – I am sure the world will not forget his name anytime soon he has really made himself and a nation proud to be South African. I’m sure Neymar won’t forget Abbubaker Mobara as he kept him at bay in the Brazilian ace at bay in their match. 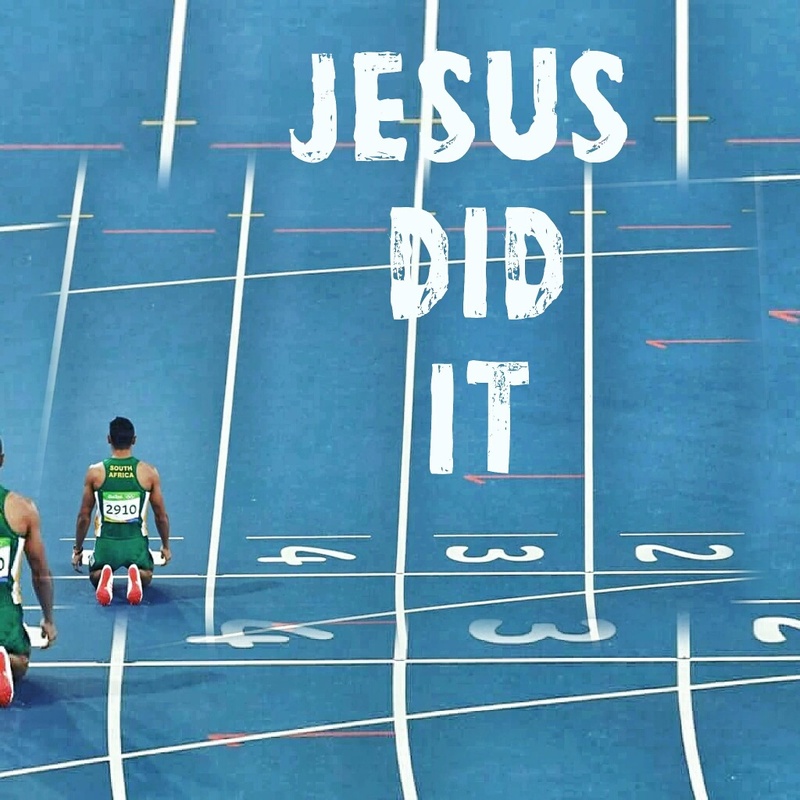 Ofcourse we had our medal hopefuls with the household names like Cameron van der Burgh, Chad Le Clos, The Blitzbokke and the many more we still going to get but it is the underdog story that really touches our hearts….and waking up this morning our hearts were racing for our country…. …it only takes seconds to be victorious, anything is possible if you believe. This entry was posted in Uncategorized on August 15, 2016 by shaunjengel. But today I want to share a prayer from a strong woman from the Bible..
​Hannah was barren. She wanted a son but God had not granted her one. She begged the Lord for a child . In return she promised to dedicate this young man to God’s service. Her son was born and she followed through on her promise. She took the child to Eli the priest and left him to be raised in the Temple. 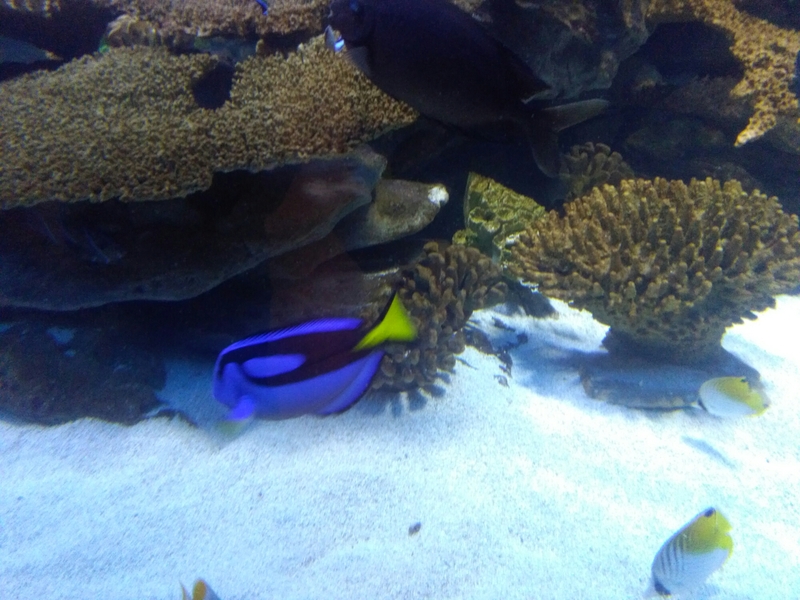 She continued to have influence over the boy’s life through the years. 1 Samuel 2 vs 1 – 10 – Holy Bible New International Version. Do not keep talking so proud or let your mouth speak such arrogance, for the LORD is a God who knows, and by him deeds are weighed. The bows of the warriors are broken, but those who stumbled are armed with strength. 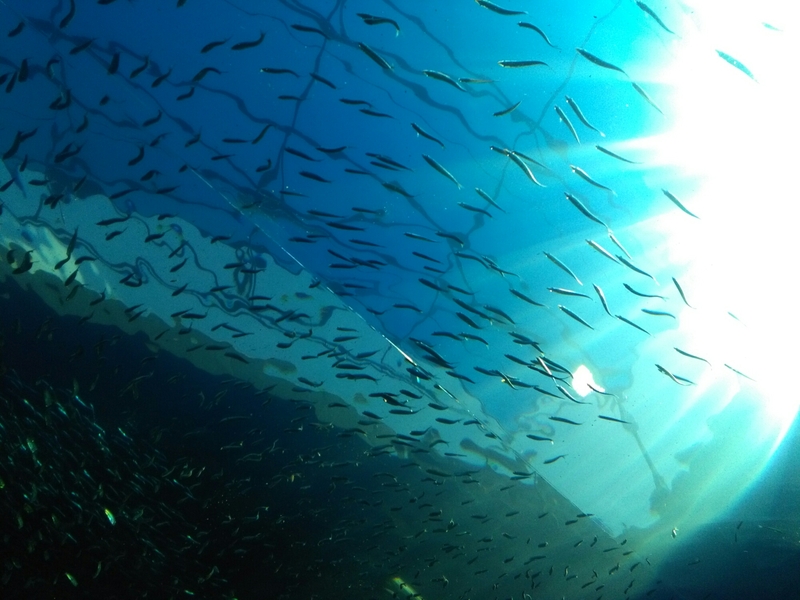 Those who were full hire themselves out for food, but those who were hungry hunger no more. She who was barren has borne seven children, but she who has had many sons pines away. The LORD brings death and makes alive; he brings down to the grave and raises up. The LORD sends poverty and wealth; he humbles and he exalts. He raises the poor from the dust and lifts the needy from the ash heap; he seats them with princes and has them inherit a throne of honour. For the foundations of the earth are the LORD’s; upon them he has set the world. He will gaurd the feer of his saints but the wicked will be silenced in darkness. It is not by strength that one prevails; those who oppose the LORD will be shattered. He will thunder against them from heaven; the LORD will judge the ends of the earth. A woman is powerful when she prays, know your worth ladies….I salute you -much love. This entry was posted in Uncategorized on August 9, 2016 by shaunjengel. War Room a movie showing us the strength in pray, how powerful you can be if you take time out and pray for what you want, surrender your problems and let GOD takeover and fight your battle. The movie will take you on a rollercoaster of emotions, from sadness, happiness, frustration, confusion to vibrant excitement at seeing that through pray all things are possible all we need to do is believe and have faith. “ Prayer, at its most basic level, was surrender. Like Jesus in the garden, saying, “Not My will, but Yours, be done. – Chris Fabry , War Room: Prayer Is a Powerful Weapon. I got the opportunity to watch this movie with our youth group, we laughed together….we were quiet and you could feel the emotion in the room everyone in deep contemplation, working through the main theme of the movie. We are building an army of believers, of young warriors who are willing and able to carry on the good fight equipping themselves with the most powerful weapon, which is FAITH through pray. My pray is for peace and prosperity for all, that we give thanks to our creator and acknowledge the spirit in all things we do. Find your WAR ROOM and equip yourself through pray. This entry was posted in Uncategorized on August 1, 2016 by shaunjengel.